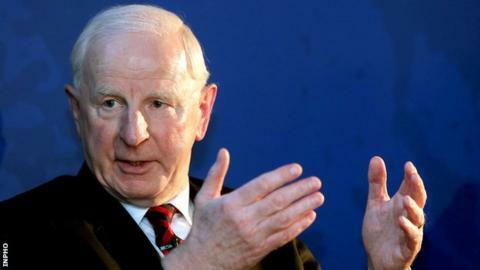 The Olympic Council of Ireland has said that it will not accept the return of its former president Pat Hickey to the organisation's board. Hickey is facing charges in Brazil over alleged ticket touting at last year's Olympic Games. An Irish Government-commissioned report into the affair was published earlier this month. The OCI says it has accepted all the findings, which included criticism of previous Games ticket arrangements. The board also agreed to co-operate fully with an International Olympic Committee (IOC) ethics commission investigation regarding Mr Hickey. Justice Moran's report found that deals between the Olympic Council of Ireland (OCI) and THG Sports, owned by Marcus Evans, and Pro10, a second company linked to the businessman, were more concerned with their commercial interests than the athletes, their friends, relatives and supporters. The report also stated that after THG's bid to become the OCI's official ticket seller at the Games was rejected by Rio's organising committee, the appointment of Pro10 only disguised THG's continuing role. Following the decision by the Pyeonchang Organising Committee in South Korea to refuse to allow THG to act as the OCI's authorised ticket seller at next year's Winter Olympics, the board said it will handle all ticketing arrangements for the Games. Ireland is expected to have a team of five to 10 athletes competing at the 2018 Games. "The board is aware that the IOC ethics commission is carrying out an investigation into the situation regarding the former OCI president," said an OCI statement. "The board agreed to fully cooperate with that investigation and to share and provide requested information and documentation to the Commission, including the Moran Report. "We expect that this process may take some time to reach a conclusion. Nonetheless the board tonight unanimously agreed that it would not accept the return of the former president to the OCI Board." The OCI has also appointed a leading accountancy firm which will seek to address issues raised in Judge Moran's report about the "absence of a full reconciliation of tickets and ticket revenue". The Irish Olympic governing body is also seeking an immediate meeting with Irish sports minister Shane Ross to request the reinstatement of state funding to the OCI. Hickey has claimed Judge Moran's report contained "inaccuracies" but refused to co-operate with the investigation and also declined to appear before an Irish parliamentary committee earlier this month. Ireland's former Olympic boss was charged by the Brazilian authorities on accusations of ticket touting, running a cartel and illicit marketing and though he returned to Ireland last December, he is still awaiting a trial date in Brazil. Hickey, THG and Pro10 have all denied any wrongdoing and the former OCI president has vowed to clear his name. Hickey, who was arrested by Rio police at the 2016 Games, has said that he wants to return to his International Olympic Committee roles, which included being president of the European Olympic Committees. A vote last February saw Sarah Keane becoming the new OCI president.